MUSKOGEE, Okla. (May 2, 2016) – As previously announced, G Fest organizers are continuing plans for the inaugural event in honor of the late Okie from Muskogee, Merle Haggard. 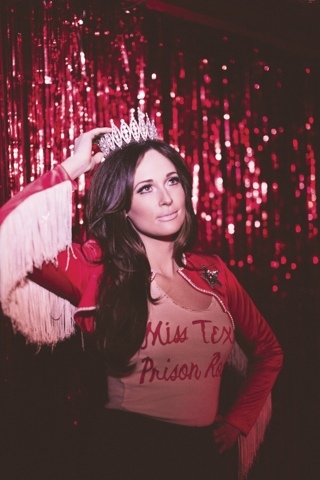 The festival, which features some of the biggest names in Country, Rock and Americana, along with the best up-and-coming and local talent, will take place as scheduled June 16-18 in Muskogee, Okla. Additionally, GRAMMY-award winning singer/songwriter Kacey Musgraves will perform at the festival to celebrate one of her heroes. “Artists like Merle Haggard are important because they became legends and set trends not by worrying about money and fame but just by being themselves. So it just inspires me even more to uphold what’s important to me as a person and songwriter first and not worry about the rest,” said Musgraves. The Oklahoma Music Hall of Fame has been given the green light to place a Merle Haggard monument on the north lawn of the Muskogee Civic Center, a step forward for a project about five years in the making. The memorial, as originally envisioned, would include a bronze sculpture of Haggard sitting on a bench with a guitar case and hat. It would be placed where visitors can take photos of "Old Glory down at the courthouse" and the Civic Center, where Haggard recorded the album Okie from Muskogee. OMHOF Executive Director Jim Blair believes an opportunity exists that would expand the scope of the memorial and add a monument Haggard designed and asked a Ponca City artist, Dan Jones, to create. Haggard planned to have the piece placed at his ranch near Bakersfield, Calif.
"They want to see that placed in Muskogee," Blair said about those who are part of Haggard's organization. "The bench will be great, but what a story to tell — to have a memorial standing next to it that was designed by Merle himself." In addition to the monument, organizers plan on revealing the "Merle Haggard Avenue" street sign in the coming months. Single-day tickets to G Fest are now available, with Thursday available for $39, Friday for $49 and Saturday for $59 until May 15. General Admission three-day passes are available for $109, and VIP Reserved Seating and VIP Party Pit tickets for $329 until May 15. VIP Reserved Seating and VIP Party Pit gives ticket holders access to an exclusive area directly in front of the stage, parking, designated bathrooms and a separate bar. For fans wanting the true G Fest experience, primitive camping is available starting at $90 and RV camping starting at $375. Festival organizers are giving ticket holders the once-in-a-lifetime opportunity to see their favorite stars up-close-and-personal with the Party Pit. Located directly in front of the main stage, the Party Pit puts fans steps away from their favorite artists during their performances! There are a very limited number of passes in this standing-room-only area, and passes must be purchased in addition to three-day or VIP tickets. Prices vary by artist and start at $10. For more information or to purchase tickets, party pit passes and for all of your G Fest needs, visit:gfestmuskogee.com. G Fest will take place June 16-18 in Muskogee, Okla., and will feature performances by The Avett Brothers, Old Crow Medicine Show, The Swon Brothers, Marty Stuart, Turnpike Troubadours, Robert Randolph & The Family Band, Jason Boland & The Stragglers, John Fullbright, Paul Thorn Band, Byron Berline Band, Dirty Dozen Brass Band, The Quebe Sisters, Uncle Lucius, Aubrie Sellers, Ricochet, Full Flava Kings, Paul Benjaman Band with Don White, Nicnos, The Cherokee Maidens, KALo, Darell Christopher & The Ingredients, The Bonham Brothers, The Red Dirt Rangers, Mountain Smoke, Hosty Duo, Desi & Cody, Carter Sampson, Brujo Roots, BC and The Big Rig, Jana Jae and Head for the Hills. Want to take advantage of our current pricing but don’t have the cash? Choose the EZ-Pay Plan at check out to split your payment up. Use it to purchase tickets, camping or add-on options. You will be billed monthly until the balance is paid in full. Your tickets will then be emailed to you. G Fest is funded through a joint effort by The Oklahoma Music Hall of Fame, The City of Muskogee, City of Muskogee Foundation and Muskogee Tourism. Net proceeds of the event will be used to further the mission of the OMHOF and further develop the infrastructure of the Hatbox complex for future festivals. To stay up-to-date on all things G Fest, like us onFacebook and follow@gfestmuskogee onTwitter and Instagram.